Don Hilger, 70, of David City, died Wednesday, June 21, 2017 at his home in David City. 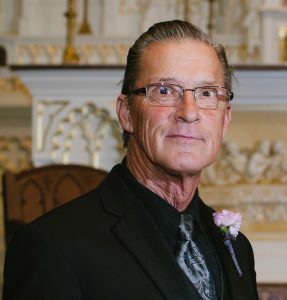 Visitation Friday 5:00 p.m. to 7:00 p.m.
Knights of Columbus Rosary 7:00 p.m.
Visitation Saturday 8:30 a.m. to 9:45 a.m.
Donald P. Hilger, 70, was born on February 15, 1947 to Paul and Helen (Homan) Hilger in David City. Don attended St. Mary’s school and graduated from Aquinas High School in 1965. He graduated from the Lincoln School of Commerce and then started Tuma and Hilger Construction in 1967. Don married Mary Lou (Vanis) in 1970 in Bellwood, NE and three children were born to this union. Don later took over the Hilger Insulation business started by his grandfather in 1941 and continued building homes under Hilger Construction alongside Les Mastera. Don also owned and operated Shop EZ convenience store for 13 years in addition to his construction and insulation business. Don served in the National Guard and was an EMT and volunteer fireman for the David City Volunteer Fire Department. He served his community throughout the years on the Youth Center Board, the Board of Region V, St. Mary’s Church board, Knights of Columbus and as Santa Claus. He was awarded the Volunteer of the Year by the Chamber of Commerce. Don had a great sense of humor and spirit of service, which touched many lives. Don enjoyed people. He enjoyed having the coffee and fire ready for the guys in the morning at the shop. He enjoyed serving his community in big and small ways that others may have never noticed unless you were the recipient of the good deed. He was a talented carpenter and enjoyed the challenge of designing, remodeling and building 150+ beautiful homes for generations to come to enjoy. Hard work was instilled in him since a young boy by doing a paper route, cleaning the theatre, helping at his dad’s Safeway store or rocking his baby brothers. Don loved taking his grandkids to the park on the tractor, hunting, fishing with his high school buddies, tinkering on old tractors and gas engines out at the ranch and liked classic cars. Don’s legacy of helping the least of those among us, loyalty, hard work, and love for his family and friends will not be forgotten. Don is survived by his wife of 47 years, Mary Lou, children Jeff, Diane (Matt) Ulmer and Scott (Ann). 4 grandchildren, Ava (7), Simon (5), Lucy (2), Bentley (8 mo. ), brothers John (Avis) Hilger, Bill (Shirley) Hilger, Max (Joan) Hilger, David and Daniel Hilger and one sister Phyllis (Jim) Vandenberg. He was preceded in death by his parents and beloved aunts and uncles. In lieu of flowers please donate a memorial in Don’s name to be designated by the family at a later date or in Don’s honor go grab your fishing pole and head to the lake, give someone a second chance, a tank of gas when they need it or just roll up your sleeves and help someone.